Cumulative renal toxicity associated with cisplatin is severe. Other major dose-related toxicities are myelosuppression, nausea, and vomiting. Anaphylactic-like reactions to cisplatin have been reported. Facial edema, bronchoconstriction, tachycardia, and hypotension may occur within minutes of cisplatin administration. Epinephrine, corticosteroids, and antihistamines have been effectively employed to alleviate symptoms (see WARNINGS and ADVERSE REACTIONS). Cisplatin Injection is a clear, colorless, sterile aqueous solution. Each 100 mL amber vial of Cisplatin Injection contains: 1 mg per mL cisplatin USP, 9 mg per mL sodium chloride, hydrochloric acid and/or sodium hydroxide to adjust pH, and water for injection USP to a final volume of 50 mL and 100 mL, respectively. The pH range of Cisplatin Injection is 3.8 to 5.9. Cisplatin Injection must be further diluted prior to administration (see DOSAGE AND ADMINISTRATION, All Patients). The active ingredient, cisplatin USP, is a yellow to orange crystalline powder. Cisplatin is a heavy metal complex containing a central atom of platinum surrounded by two chloride atoms and two ammonia molecules in the cis position. It is soluble in water or saline at 1 mg per mL and in dimethylformamide at 24 mg per mL. It has a melting point of 207°C. Plasma concentrations of the parent compound, cisplatin, decay monoexponentially with a half-life of about 20 to 30 minutes following bolus administrations of 50 or 100 mg/m2 doses. Monoexponential decay and plasma half-lives of about 0.5 hour are also seen following 2 hour or 7 hour infusions of 100 mg/m2. After the latter, the total-body clearances and volumes of distribution at steady-state for cisplatin are about 15 to 16 L/h/m2 and 11 to 12 L/m2. Cisplatin does not undergo the instantaneous and reversible binding to plasma proteins that is characteristic of normal drug-protein binding. However, the platinum from cisplatin, but not cisplatin itself, becomes bound to several plasma proteins, including albumin, transferrin, and gamma globulin. Three hours after a bolus injection and two hours after the end of a three hour infusion, 90% of the plasma platinum is protein bound. The complexes between albumin and the platinum from cisplatin do not dissociate to a significant extent and are slowly eliminated with a minimum half-life of five days or more. 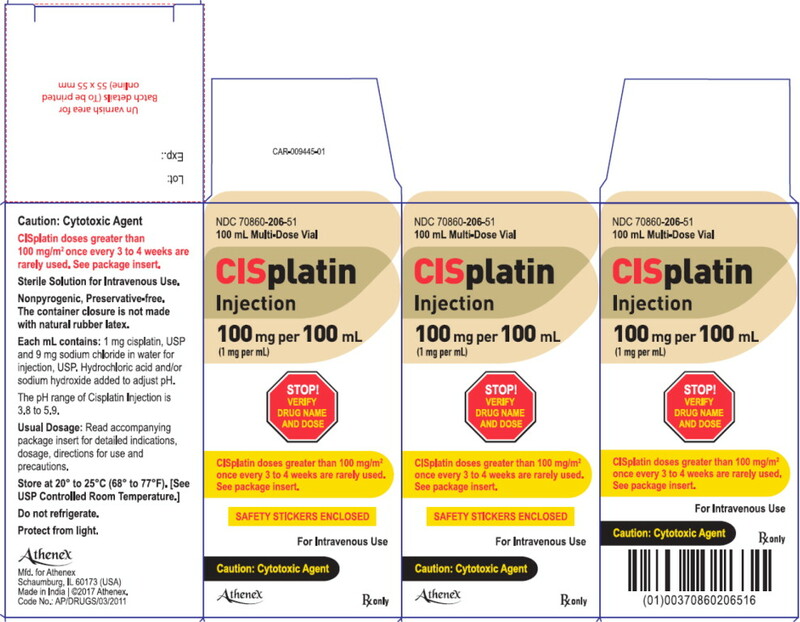 Over a dose range of 40 to 140 mg cisplatin/m2 given as a bolus injection or as infusions varying in length from 1 hour to 24 hours, from 10% to about 40% of the administered platinum is excreted in the urine in 24 hours. Over five days following administration of 40 to 100 mg/m2 doses given as rapid, 2 hour to 3 hour, or 6 hour to 8 hour infusions, a mean of 35% to 51% of the dosed platinum is excreted in the urine. Similar mean urinary recoveries of platinum of about 14% to 30% of the dose are found following five daily administrations of 20, 30, or 40 mg/m2/day. Only a small percentage of the administered platinum is excreted beyond 24 hours post-infusion and most of the platinum excreted in the urine in 24 hours is excreted within the first few hours. Platinum-containing species excreted in the urine are the same as those found following the incubation of cisplatin with urine from healthy subjects, except that the proportions are different. The parent compound, cisplatin, is excreted in the urine and accounts for 13% to 17% of the dose excreted within one hour after administration of 50 mg/m2. The mean renal clearance of cisplatin exceeds creatinine clearance and is 62 and 50 mL/min/m2 following administration of 100 mg/m2 as 2 hour or 6 hour to 7 hour infusions, respectively. In established combination therapy with other approved chemotherapeutic agents in patients with metastatic ovarian tumors who have already received appropriate surgical and/or radiotherapeutic procedures. An established combination consists of cisplatin and cyclophosphamide. Cisplatin Injection, as a single agent, is indicated as secondary therapy in patients with metastatic ovarian tumors refractory to standard chemotherapy who have not previously received Cisplatin Injection therapy. Cisplatin is contraindicated in patients with pre-existing renal impairment. Cisplatin should not be employed in myelosuppressed patients, or in patients with hearing impairment. 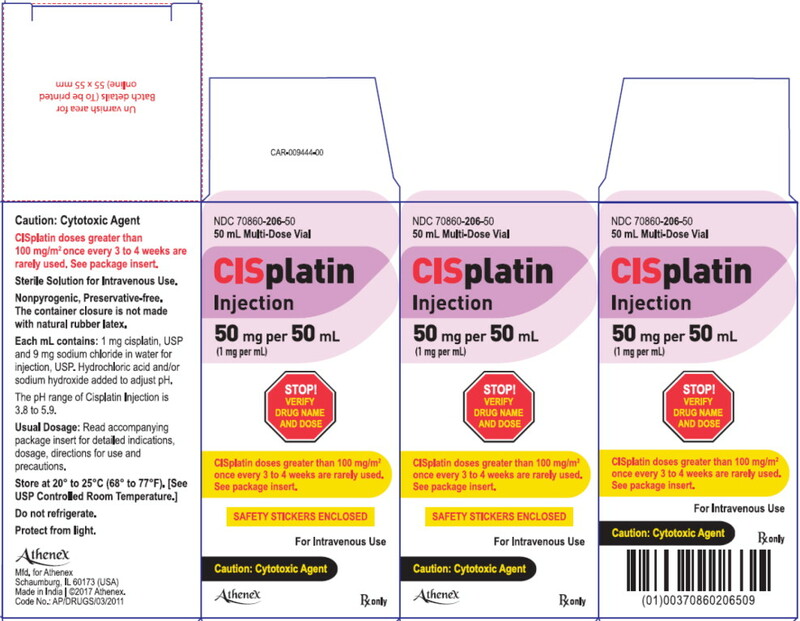 Cisplatin is contraindicated in patients with a history of allergic reactions to cisplatin or other platinum containing compounds. Cisplatin produces cumulative nephrotoxicity which is potentiated by aminoglycoside antibiotics. The serum creatinine, blood urea nitrogen (BUN), creatinine clearance, and magnesium, sodium, potassium, and calcium levels should be measured prior to initiating therapy, and prior to each subsequent course. At the recommended dosage, cisplatin should not be given more frequently than once every 3 to 4 weeks (see ADVERSE REACTIONS). Elderly patients may be more susceptible to nephrotoxicity (see PRECAUTIONS, Geriatric Use). There are reports of severe neuropathies in patients in whom regimens are employed using higher doses of cisplatin or greater dose frequencies than those recommended. These neuropathies may be irreversible and are seen as paresthesias in a stocking-glove distribution, areflexia, and loss of proprioception and vibratory sensation. Elderly patients may be more susceptible to peripheral neuropathy (see PRECAUTIONS, Geriatric Use). Anaphylactic-like reactions to cisplatin have been reported. These reactions have occurred within minutes of administration to patients with prior exposure to cisplatin, and have been alleviated by administration of epinephrine, corticosteroids, and antihistamines. Cisplatin can commonly cause ototoxicity which is cumulative and may be severe. Audiometric testing should be performed prior to initiating therapy and prior to each subsequent dose of drug (see ADVERSE REACTIONS). All pediatric patients receiving cisplatin should have audiometric testing at baseline, prior to each subsequent dose of drug and for several years post therapy. Cisplatin can cause fetal harm when administered to a pregnant woman. Cisplatin is mutagenic in bacteria and produces chromosome aberrations in animal cells in tissue culture. In mice cisplatin is teratogenic and embryotoxic. If this drug is used during pregnancy or if the patient becomes pregnant while taking this drug, the patient should be apprised of the potential hazard to the fetus. Patients should be advised to avoid becoming pregnant. The carcinogenic effect of cisplatin was studied in BD IX rats. Cisplatin was administered intraperitoneally (i.p.) to 50 BD IX rats for 3 weeks, 3 x 1 mg/kg body weight per week. Four hundred and fifty-five days after the first application, 33 animals died, 13 of them related to malignancies: 12 leukemias and 1 renal fibrosarcoma. The development of acute leukemia coincident with the use of cisplatin has been reported. In these reports, cisplatin was generally given in combination with other leukemogenic agents. Injection site reactions may occur during the administration of cisplatin (see ADVERSE REACTIONS). Given the possibility of extravasation, it is recommended to closely monitor the infusion site for possible infiltration during drug administration. A specific treatment for extravasation reactions is unknown at this time. In a randomized trial in advanced ovarian cancer, response duration was adversely affected when pyridoxine was used in combination with altretamine (hexamethylmelamine) and cisplatin. Cisplatin has been reported to be found in human milk; patients receiving cisplatin should not breast-feed. Safety and effectiveness in pediatric patients have not been established. All children should have audiometric monitoring performed prior to initiation of therapy, prior to each subsequent dose, and for several years post therapy. Advanced testing methods may allow for earlier detection of hearing loss in an attempt to facilitate the rapid initiation of interventions that can limit the potential adverse impact of hearing impairment on a child's cognitive and social development. Insufficient data are available from clinical trials of cisplatin in the treatment of metastatic testicular tumors or advanced bladder cancer to determine whether elderly patients respond differently than younger patients. In four clinical trials of combination chemotherapy for advanced ovarian carcinoma, 1,484 patients received cisplatin either in combination with cyclophosphamide or paclitaxel. Of these, 426 (29%) were older than 65 years. In these trials, age was not found to be a prognostic factor for survival. However, in a later secondary analysis for one of these trials, elderly patients were found to have shorter survival compared with younger patients. In all four trials, elderly patients experienced more severe neutropenia than younger patients. Higher incidences of severe thrombocytopenia and leukopenia were also seen in elderly compared with younger patients, although not in all cisplatin-containing treatment arms. In the two trials where nonhematologic toxicity was evaluated according to age, elderly patients had a numerically higher incidence of peripheral neuropathy than younger patients. Other reported clinical experience suggests that elderly patients may be more susceptible to myelosuppression, infectious complications, and nephrotoxicity than younger patients. Cisplatin is known to be substantially excreted by the kidney and is contraindicated in patients with pre-existing renal impairment. Because elderly patients are more likely to have decreased renal function, care should be taken in dose selection, and renal function should be monitored. Dose-related and cumulative renal insufficiency, including acute renal failure, is the major dose-limiting toxicity of cisplatin. Renal toxicity has been noted in 28% to 36% of patients treated with a single dose of 50 mg/m2. It is first noted during the second week after a dose and is manifested by elevations in BUN and creatinine, serum uric acid and/or a decrease in creatinine clearance. Renal toxicity becomes more prolonged and severe with repeated courses of the drug. Renal function must return to normal before another dose of cisplatin can be given. Elderly patients may be more susceptible to nephrotoxicity (see PRECAUTIONS, Geriatric Use). Impairment of renal function has been associated with renal tubular damage. The administration of cisplatin using a 6 hour to 8 hour infusion with intravenous hydration, and mannitol has been used to reduce nephrotoxicity. However, renal toxicity still can occur after utilization of these procedures. Ototoxicity has been observed in up to 31% of patients treated with a single dose of cisplatin 50 mg/m2, and is manifested by tinnitus and/or hearing loss in the high frequency range (4,000 to 8,000 Hz). The prevalence of hearing loss in children is particularly high and is estimated to be 40 to 60%. Decreased ability to hear normal conversational tones may occur. Deafness after the initial dose of cisplatin has been reported. Ototoxic effects may be more severe in children receiving cisplatin. Hearing loss can be unilateral or bilateral and tends to become more frequent and severe with repeated cisplatin doses. It is unclear whether cisplatin-induced ototoxicity is reversible. Vestibular toxicity has also been reported. Ototoxic effects may be related to the peak plasma concentration of cisplatin. Ototoxicity can occur during treatment or be delayed. Audiometric monitoring should be performed prior to initiation of therapy, prior to each subsequent dose, and for several years post therapy. The risk of ototoxicity may be increased by prior or simultaneous cranial irradiation, and may be more severe in patients less than 5 years of age, patients being treated with other ototoxic drugs (e.g., aminoglycosides and vancomycin), and in patients with renal impairment. Genetic factors (e.g., variants in the thiopurine S-methyltransferase [TPMT] gene) may contribute to cisplatin-induced ototoxicity; although this association has not been consistent across populations and study designs. Myelosuppression occurs in 25% to 30% of patients treated with cisplatin. The nadirs in circulating platelets and leukocytes occur between days 18 to 23 (range 7.5 to 45) with most patients recovering by day 39 (range 13 to 62). Leukopenia and thrombocytopenia are more pronounced at higher doses (>50 mg/m2). Anemia (decrease of 2 g hemoglobin/100 mL) occurs at approximately the same frequency and with the same timing as leukopenia and thrombocytopenia. Fever and infection have also been reported in patients with neutropenia. Potential fatalities due to infection (secondary to myelosuppression) have been reported. Elderly patients may be more susceptible to myelosuppression (see PRECAUTIONS, Geriatric Use). Marked nausea and vomiting occur in almost all patients treated with cisplatin, and may be so severe that the drug must be discontinued. Nausea and vomiting may begin within 1 hour to 4 hours after treatment and last up to 24 hours. Various degrees of vomiting, nausea and/or anorexia may persist for up to 1 week after treatment. Delayed nausea and vomiting (begins or persists 24 hours or more after chemotherapy) has occurred in patients attaining complete emetic control on the day of cisplatin therapy. Vascular toxicities coincident with the use of cisplatin in combination with other antineoplastic agents have been reported. The events are clinically heterogeneous and may include myocardial infarction, cerebrovascular accident, thrombotic microangiopathy (hemolytic-uremic syndrome [HUS]), or cerebral arteritis. Various mechanisms have been proposed for these vascular complications. There are also reports of Raynaud's phenomenon occurring in patients treated with the combination of bleomycin, vinblastine with or without cisplatin. It has been suggested that hypomagnesemia developing coincident with the use of cisplatin may be an added, although not essential, factor associated with this event. However, it is currently unknown if the cause of Raynaud's phenomenon in these cases is the disease, underlying vascular compromise, bleomycin, vinblastine, hypomagnesemia, or a combination of any of these factors. Hypomagnesemia, hypocalcemia, hyponatremia, hypokalemia, and hypophosphatemia have been reported to occur in patients treated with cisplatin and are probably related to renal tubular damage. Tetany has been reported in those patients with hypocalcemia and hypomagnesemia. Generally, normal serum electrolyte levels are restored by administering supplemental electrolytes and discontinuing cisplatin. Neurotoxicity, usually characterized by peripheral neuropathies, has been reported. The neuropathies usually occur after prolonged therapy (4 to 7 months); however, neurologic symptoms have been reported to occur after a single dose. Although symptoms and signs of cisplatin neuropathy usually develop during treatment, symptoms of neuropathy may begin 3 to 8 weeks after the last dose of cisplatin. Cisplatin therapy should be discontinued when the symptoms are first observed. The neuropathy, however, may progress further even after stopping treatment. Preliminary evidence suggests peripheral neuropathy may be irreversible in some patients. Elderly patients may be more susceptible to peripheral neuropathy (see PRECAUTIONS, Geriatric Use). Muscle cramps, defined as localized, painful, involuntary skeletal muscle contractions of sudden onset and short duration, have been reported and were usually associated in patients receiving a relatively high cumulative dose of cisplatin and with a relatively advanced symptomatic stage of peripheral neuropathy. Optic neuritis, papilledema, and cerebral blindness have been reported in patients receiving standard recommended doses of cisplatin. Improvement and/or total recovery usually occurs after discontinuing cisplatin. Steroids with or without mannitol have been used; however, efficacy has not been established. Blurred vision and altered color perception have been reported after the use of regimens with higher doses of cisplatin or greater dose frequencies than recommended in the package insert. The altered color perception manifests as a loss of color discrimination, particularly in the blue-yellow axis. The only finding on funduscopic exam is irregular retinal pigmentation of the macular area. Anaphylactic-like reactions have been reported in patients previously exposed to cisplatin. The reactions consist of facial edema, wheezing, tachycardia, and hypotension within a few minutes of drug administration. Reactions may be controlled by intravenous epinephrine with corticosteroids and/or antihistamines as indicated. Patients receiving cisplatin should be observed carefully for possible anaphylactic-like reactions and supportive equipment and medication should be available to treat such a complication. Transient elevations of liver enzymes, especially SGOT, as well as bilirubin, have been reported to be associated with cisplatin administration at the recommended doses. Local soft tissue toxicity has been reported following extravasation of cisplatin. Severity of the local tissue toxicity appears to be related to the concentration of the cisplatin solution. Infusion of solutions with a cisplatin concentration greater than 0.5 mg/mL may result in tissue cellulitis, fibrosis, necrosis, pain, edema, and erythema. Caution should be exercised to prevent inadvertent overdosage with cisplatin. Acute overdosage with this drug may result in kidney failure, liver failure, deafness, ocular toxicity (including detachment of the retina), significant myelosuppression, intractable nausea and vomiting and/or neuritis. In addition, death can occur following overdosage. No proven antidotes have been established for cisplatin overdosage. Hemodialysis, even when initiated four hours after the overdosage, appears to have little effect on removing platinum from the body because of cisplatin's rapid and high degree of protein binding. Management of overdosage should include general supportive measures to sustain the patient through any period of toxicity that may occur. Pretreatment hydration with 1 to 2 liters of fluid infused for 8 to 12 hours prior to a cisplatin dose is recommended. The drug is then diluted in 2 liters of 5% Dextrose in 1/2 or 1/3 normal saline containing 37.5 g of mannitol, and infused over a 6 hour to 8 hour period. If diluted solution is not to be used within 6 hours, protect solution from light. Do not dilute cisplatin in just 5% Dextrose Injection. Adequate hydration and urinary output must be maintained during the following 24 hours. The aqueous solution should be used intravenously only and should be administered by IV infusion over a 6 hour to 8 hour period (see DOSAGE AND ADMINISTRATION). Store at 20° to 25°C (68° to 77°F). [See USP Controlled Room Temperature]. Do not refrigerate. Protect unopened container from light. The above products are multiple dose vials packaged individually.